While most media is focussed on the US “fiscal cliff” this week, many futurists think that we are very close to – or have already reached – another cliff; the civilizational tipping point, where the carrying capacity of our planet can no longer handle our activity. We now therefore have the choice to either enter a sustainability era or face some form of civilizational collapse or other less dramatic descent scenario. 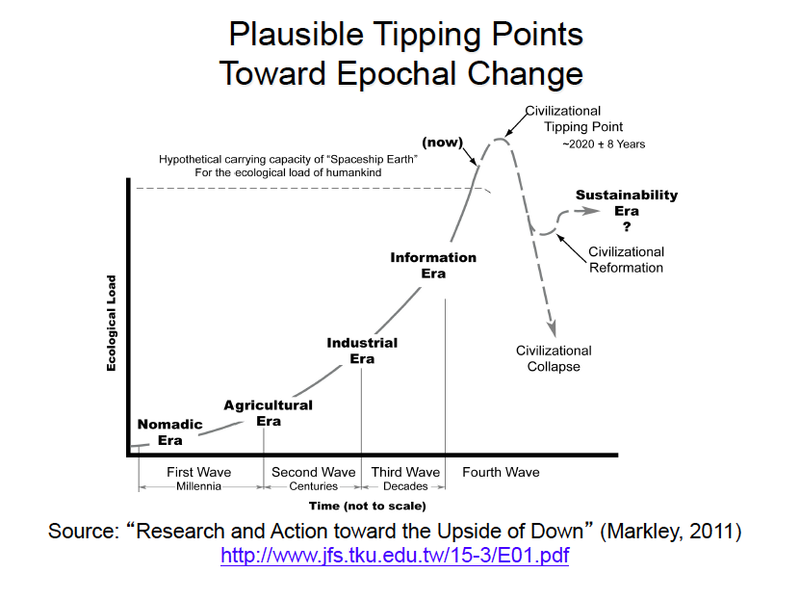 As the image indicates, Oliver Markley’s research estimates that this tipping point is between 2012 and 2028. I’m reflecting on our personal actions if we would subscribe to Markley’s ideas and time frames. If his research and conclusions are right, i.e. we would see some dramatic change within the next couple of decades, would you still act as you do now? Would you continue to do the work you do and live the life you do?